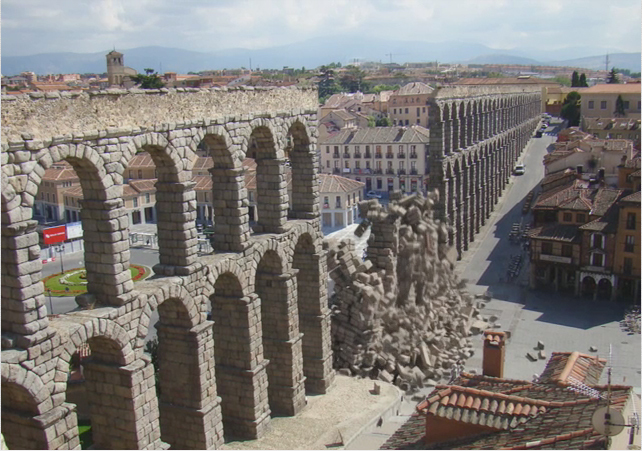 This project was about making an ancient building collapse, in the way it looks as much real as possible, we decide to demolish digitally the Acueducto of Segovia, becouse it was a challenge and becouse the real building was nearby Madrid( Spain) where we are located. 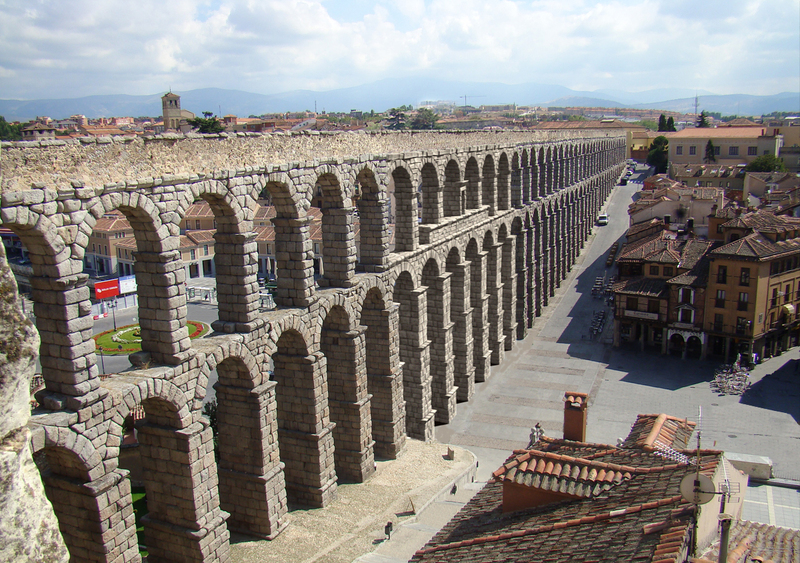 So first step was going there and take some shots of the real building, from different pespectives, by the way Segovia is a very nice medieval site to visit. 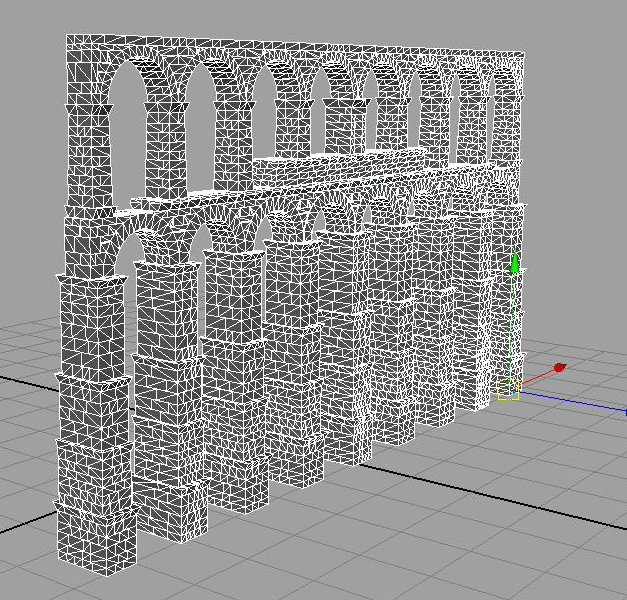 Then we built a digital version of the central part of the acueducto, this was done in Maya, becouse Pedro Ivan made every brick of the Acueducto as a single object and textured it, there are more than 4000 bricks in this model, and Maya happens to be easier than Max to model the whole thing. 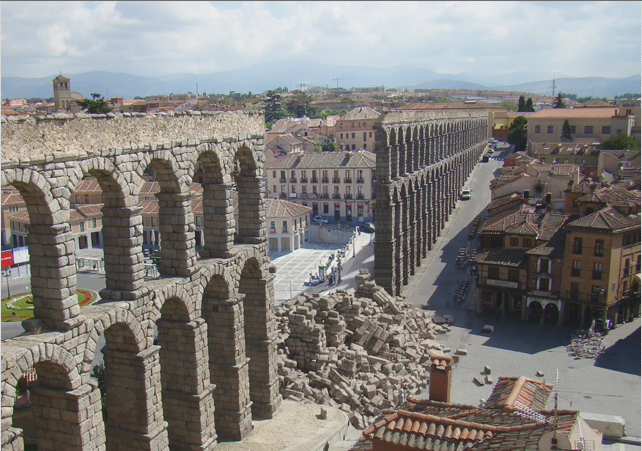 In addition the central part of the picture was removed using a 2D paint tool, and Pedro managed to fill the “hole”, with background buildings which should be behind the Acueducto but obviusly doenst appears in the picture. The trick was taken some shots of the buildings behind it, and compose later both takes. I took the 3D model, by my side and start to make demolition test with Pulldownit, we havent tested anything so huge till then, it tooks several weeks to fix and improve the solver for being able to simulate such things, the most dificult issue for computing dynamics was the fact the Acueducto is made of arcs, this structure stand very well in the real world but it is extremely dificult to mimic its behaviour somehow in the computer. 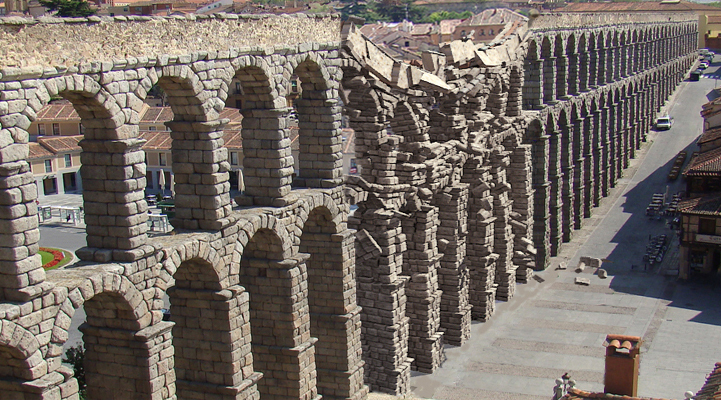 We finally managed to made the Acueducto demolition in 3D, the final simulation tooks about 25 min to be done with Pulldownit in Max, we had to export the model to Max becouse the render using V-ray, was definetively easier to be done. but it still left to integrate the 3D model with the real picture, this was done using a composition tool, we took care specially of the render light which had to match exactly the light in the 2D picture. For the final shot Pedro added also some particles in postproduction for dust and smoke, by adding particles directly in 3D you ussually get a better integration but at cost of terrible render times, for this kind of shot where the camera is fixed, without rounds around the model emmiting particles, 2D particles ussually do a good job, so it did the trick.